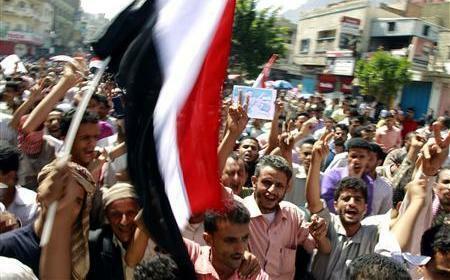 Thousands fled Sanaa Thursday as tribesmen and loyalist troops battled for the third day running. Witnesses say the fighting was the fiercest so far after loyalist forces who had received US training as part of its “war on terror” joined the battle. But medics said they had no word yet on casualties from Thursday’s fighting as ambulance crews were unable to access the Al-Hasaba neighbourhood of north Sanaa where Ahmar has his base. “The bodies are still scattered in Al-Hasaba and ambulances cannot reach it due to the dangerous situation there,” a medical official said. Residents said the fighting was the fiercest so far after loyalist special forces who had received US training as part of Washington’s “war on terror” joined the battle. Thousands of armed tribesmen were on their way to Sanaa to boost Ahmar’s forces, tribal leaders said. Witnesses said a warplane broke the sound barrier over Ahmar’s hometown of Khamr, 80 kilometres (50 miles) north of Sanaa, in an apparent attempt to intimidate the tribesmen of his Hashid confederation. Mohsen Sinan, 70, said he and 30 members of his household were trying to flee Sanaa along with many other residents. “Sanaa is deserted now and if these battles continue, Yemen will be finished,” he said. “The date for the signing will be set soon based on consultations and coordination between Yemen and the Gulf Cooperation Council states,” the official Saba news agency quoted the spokesman as saying. Yemen has one of the highest rates of private gun ownership in the world with an average of some three per person.